Well. Despite the plans, skydiving didn't happen in the 99-00 season, at least not at Pole, although they did succeed in conducting the first hot-air balloon flights near the station and some jumps at Patriot Hills (PH). The original plans for the "Millennium Expedition" or perhaps the "Russian Antarctic Expedition" called for a massive skydiving assault on the silver ball, but that was called off for various reasons including the lack of an environmental permit for the fuel dump they needed at PH. Here is that story from the 2/2/2000 AAD news update. This Millennium Expedition web site now has a detailed page of photos from the event.. The second IL-76 flight to PH dropped 32 skydivers out over that site on 1 January. 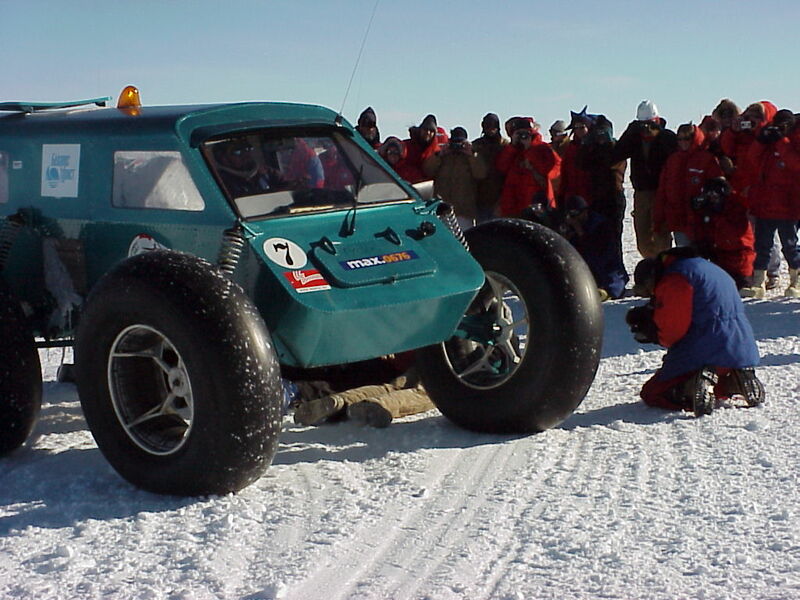 Meanwhile, on 26 December eight "snow bugs," their Russian-built 6x6 large-tired gasoline powered vehicles with Ford Probe or Peugeot engines, set out on the drive to Pole with 31 people and 2 hot-air balloons. Four turned back, the other 4 arrived at Pole on 8 January. 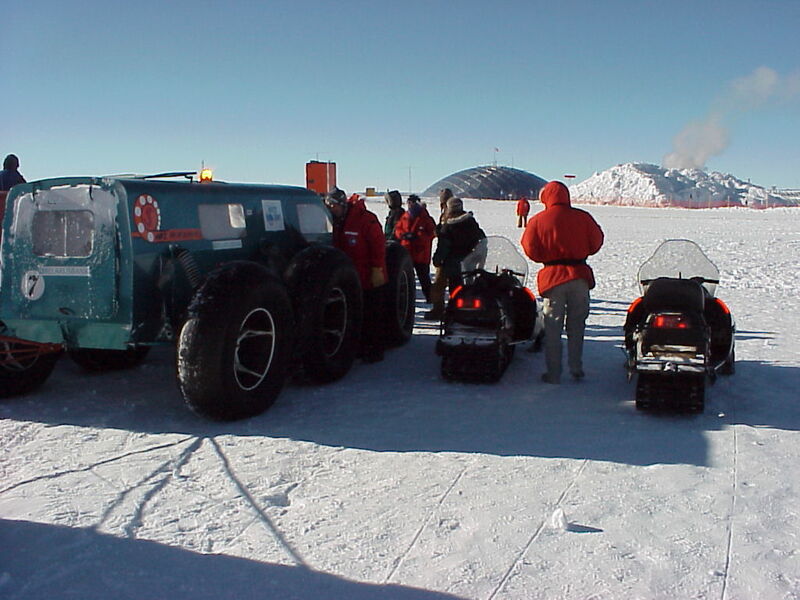 Cruising speed of these vehicles is 20-25 mph, it is a 620+ mile trip, but although these custom-built vehicles were tested in Siberia, they were untried in Antarctica or at altitude until now. Anyway, now we know. 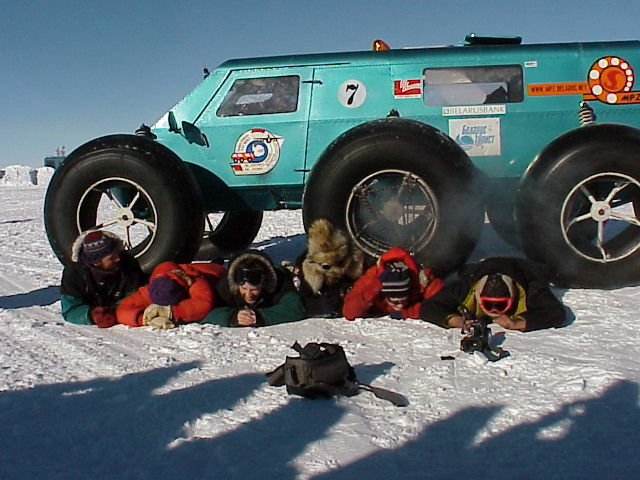 AMANDA guy Jerry Przybylski sent around some photos, here is part of the group in front of the station, here is a closeup of one of the "snow bugs" taken while they were demonstrating the low-ground-pressure tires by running over Pole people with no ill effects, and this is Robert Thompson's picture from the other side of the vehicle. Ouch! 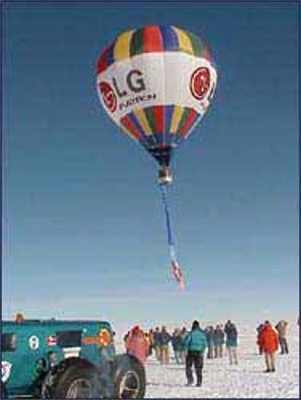 The group launched a hot-air balloon, the first at Pole, before leaving the next day. Oh yes, after they left, a money belt was found in the upper galley with several thousand dollars and no ID (!) but honesty prevails and it will get back to the owner...via NZ etc. Oh yes, it seems that 6 members of the group stayed at PH after the rest left, they arranged for ANI to take them to Pole (via Twin Otter landing, not a parachute event). As of 24 January they were back at PH from where they flew back to PA a few days later. Skydivers! The REST of the story... is well covered on Steven McLachlan's page which features several pages of reports, photos, and covers, including an in-depth report by the Austrian balloon pilot Ivan Trifonov, who made the trip, as well as an article by Steven Vlegels of the Flying Circus balloon team, who offers a different point of view. Yet another account, by Curtis Lieber, the medical officer, can be found here. A strange tale to be sure! The organization that put on this event is in part the same NGA group that sponsored the ill-fated skydiving event on 7 December 1997 when 6 people--2 Norwegians attempting a tandem jump, 1 Austrian, and 3 Americans--jumped from a Twin Otter at Pole. The Austrian and 2 of the Americans died when they landed after little or no attempt to open their chutes. My coverage of that sad day is here. Polar Skydiving LTD was planning to show up around 1/1/2000 and jump out of ANI's Basler twin turbo aircraft (rebuilt and as-new ex-DC-3's). Only $19.5K out of PA... no go not enough takers so that idea has faded away.